I’m a bit of a sucker for Microgaming’s outdoors-themed Alaskan Fishing slot, with its slick animation, nice game-play and gentle feel, and so I liked the sound of slot developer Playtech’s Arctic Treasure from the outset. Wolves, owls, frozen tundra – what’s not to like about this 5-reel, 20-payline slot that rewards free spins and jackpots galore? On the reels of this game based in the Frozen North you’ll find a great white owl, a prowling wolf, a polar bear, crystals, Eskimos, and some suitably chilly-looking 10-through-Ace symbols. All wallets are catered for in the game, with a lowly $0.01 per coin bet allowed, but a massive $1,000 maximum bet available too. The Arctic Princess – looking like some kind of elf out of a World of Warcraft-type game – acts as the game’s Wild, and she substitutes for all regular symbols, other than the Scatter and Bonus icons. Five Wilds across the reels awards a juicy jackpot of 10,000 coins. Look out for the kayak-steering Eskimo, as this Scatter can bag you some nice wins. Three or more anywhere on the reels triggers a free spins round. 10 spins with a 3x multiplier are awarded straight off the bat – nothing to turn your chilly nose up at. The spins can also be re-triggered. Eskimos aren’t the only thing to watch out for. The crystal Scatter triggers another bonus when you hit crystals on Reels 1 and 5 at the same time. You’ll be taken to an icy crystal cavern with a series of 12 crystals. Yep, it’s essentially a basic Pick ‘em Bonus game and you’ll have to choose three crystals to discover your win. With Playtech you know you’re in good hands when it comes to solid slots fare. 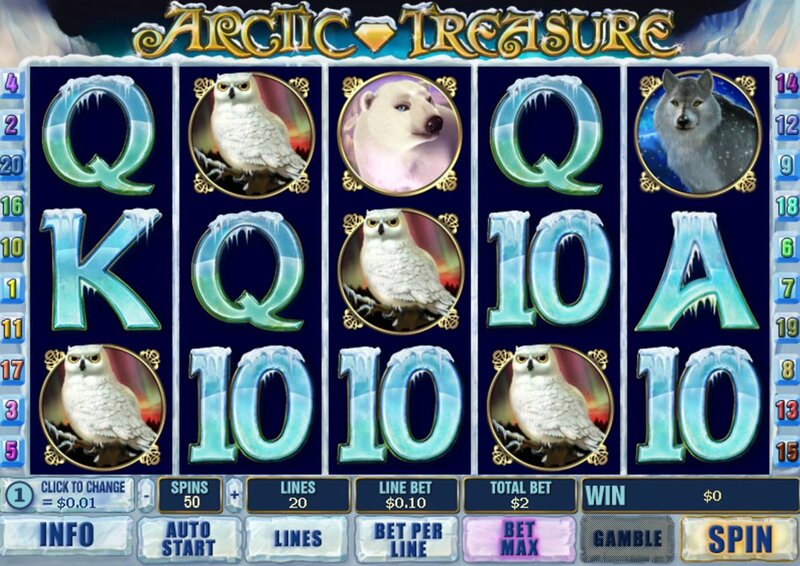 The theme is attractive, the bonus rounds decent, if unspectacular, and overall Arctic Treasure is a reliable slot that’s like slipping on a warm pair of slippers – and in this chilly landscape, they’re probably badly needed. 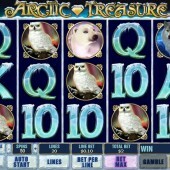 For a more comical slot playing experience you might want to check out Microgaming's Arctic Agents slot.